Salina is located north of Wichita along the Saline and Smoky Hill Rivers, situated at the intersection of Interstate Highways I-70 and I-135. Salina is served by one commercial airline at Salina Municipal Airport, but most air travel is done at larger airports in Wichita and Kansas City, Missouri. 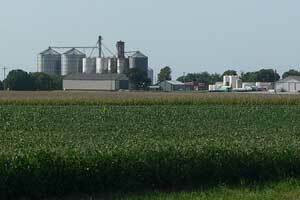 Agriculture is the predominant industry in Salina, and its grain elevators are visible from miles away. Salina has several important employers including Tony’s Pizza, a Schwan Food Company brand which is Salina’s largest single employer with over 2000 workers employed. Tony’s makes consumer retail frozen pizzas as well as food intended for school cafeterias and other institutions. Additionally, over 500 are employed in factories for Philips Lighting, Exide Battery, Great Plains Manufacturing (farm equipment), ElDorado National (commercial bus manufacturer) and Raytheon Aircraft.